Whisky is one of the most enjoyed spirited beverage around the world! Last week, I attended a wonderful whisky tasting session by Tomatin Whisky at 61 Monarchy a speakeasy bar that specializes in whiskies. 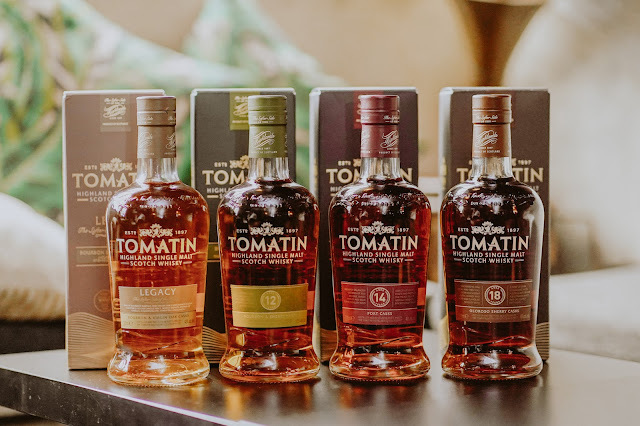 I had a chance to be entertained and educated about the origins Tomatin whisky, how it's made and what makes it a winner of several notable awards. Founded in the late 1800s, the Tomatin whisky distillery sits at an altitude of 315 meters above sea level just to the west village of the same name and quenches its annual five million liter capacity with the pure waters of the Alt-na-Frith burn. The distillery’s private water source, which runs clear and pure through the Monadhliath Mountains help to create a Highland Malt with delicate flavors, yet rich and mellow style. Although it is one of the largest distilleries around, it is still relatively unknown to the outside world. 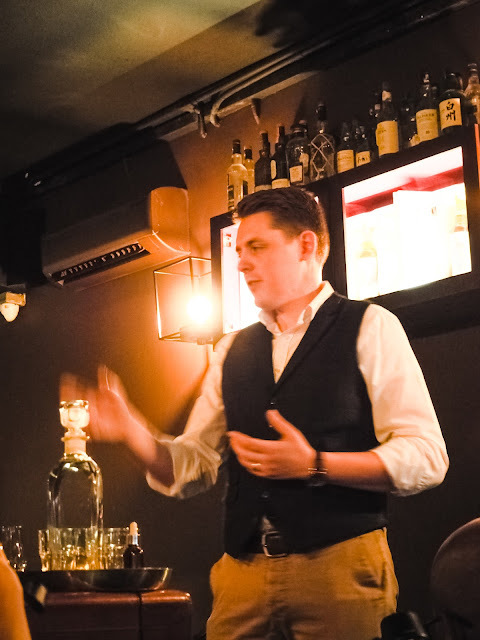 It was a truly a enjoyable session, we had Scott, the ambassador who flew all the way in from the distillery to guide us on the taste, smell and describe the different scents starting from Tomatin Legacy, Tomatin 12 year old, Tomatin 14 Year Old, and Tomatin 18 Year Old. 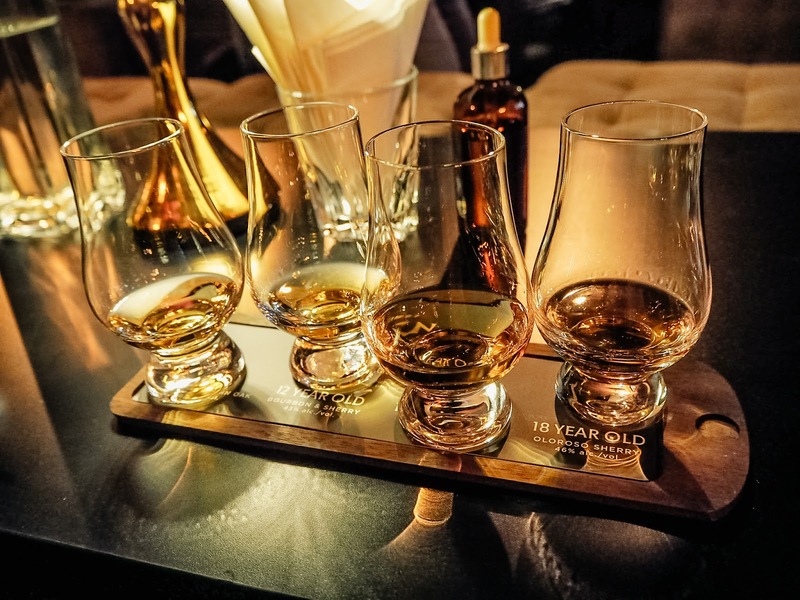 Having been matured in traditional Scotch Whisky, ex-Bourbon and ex-Spanish casks. A rich, fruity aroma hits the nose first which is a prelude to sweet flavours of ripe apples, pears and a subtle hint of nut before the long, pleasantly oily finish. On the palate, this is a very pleasant whisky. It’s malt-forward, with plenty of spice. It’s smooth, but not dull; tasty without a hint of peat. Also award winning, the Tomatin 14 Year Old is soft, smooth and sweet, benefiting from its time spent in Tawny Port casks which previously held port for around 50 years. Rich but balanced aromas of red berries, sweet honey, and rich toffee develop into aspects of light fruits and nuts on the palate and an abiding finish of fruit salad. The Tomatin 18 Year Old is a truly world class malt. Matured in traditional oak casks and first-fill Oloroso Sherry butts, this is undoubtedly an elegant whisky. The taste of clean sherry is present throughout and it is one of the main highlights of this whisky. Although the nose is rather inviting, it only hints at the magic that is to come. It hits the palate with a firework display of dried fruits, cinnamon, vanilla and oak that develops into a dash of dark chocolate with a citrus bite before a sustained sweet and slightly dry finish. Then, there is Tomatin distillery's new no-age-statement release, Tomatin Legacy. It is a tribute to its dedicated craftsmen. The time spent in Bourbon barrels and Virgin Oak casks brings a light sweetness to The Tomatin Legacy. It boasts aromas of vanilla, marshmallow, pineapple, and lemon. On the palate gentle flavors of candy, pine, lemon sherbet, apples, and sponge cake emerge ahead of a light, clean finish. The whisky comes ablaze on the tongue. The malts are young albeit, but they’re clean and crisp and under the reigns. As this whisky fades into the sunset the malts go on cruise control, leaving you with some delicate spices on the fade away. Truly an undiscovered whisky for all Single Malt lovers out there. The Tomatin range brings with it an air of mystery. It delivers a taste of the Scottish Highlands in a glass and will continue to surprise the palate throughout each of its expressions. To enjoy your choice of Tomatin, head over to 61 Monarchy and savour a bit of the highlands for yourself.